Sean Penn is an American actor and filmmaker. Sean Penn also directs films and music videos, including videos for musicians such as Shania Twain and Lyle Lovett. His full name is Sean Justin Penn. Sean Penn is a political activist and once placed a $56,000 ad in the Washington Post to ask President George W. Bush to end the cycle of violence, in reference to the War on Terror and the planned attack in Iraq. Sean Penn was born on August 17, 1960 in Los Angeles County, California. 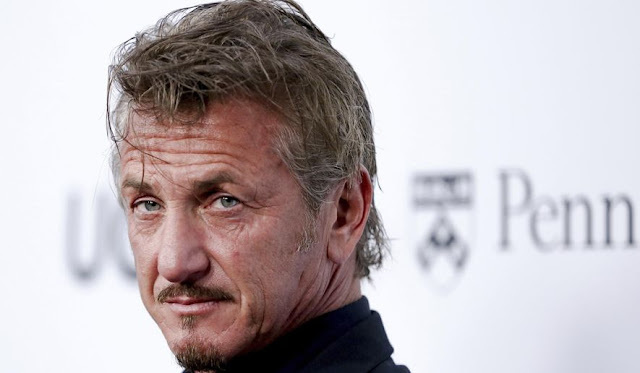 Sean Penn has been praised for his work to help the victims of Hurricane Katrina in 2005. His father, Leo Penn was an actor and director and his mother Eileen Ryan (née Annucci) was an actress. Sean Penn met with the Mexican drug kingpin El Chapo in 2015 at an undisclosed location. He was interviewing him for a potential movie about his life. El Chapo was arrested the next day but it uncertain whether Sean Penn's meeting helped lead the authorities to the wanted fugitive. His older brother is musician Michael Penn. His younger brother, actor Chris Penn, died in 2006. His paternal grandparents were Ashkenazi Jewish emigrants from Lithuania and Russia, while his mother is a Catholic of Irish and Italian descent. Sean Penn grew up in Los Angeles, and attended Santa Monica High School. He began making short films with some of his childhood friends, including actors Emilio Estevez and Charlie Sheen, who lived near his home. Penn chose to forgo college and instead joined the Los Angeles Repertory Theater. Sean Penn's grandparents opened a Jewish deli in New York City. His family is of Russian, Lithuanian, Irish, and Italian descent. After a few television appearances, including a role in an episode of Barnaby Jones (1979), he moved to New York City in 1980. He soon landed a part in a Off-Broadway play, Heartland. Penn launched his film career with the action-drama Taps (1981), where he played a military high school cadet. Then he appeared in the hit comedy Fast Times at Ridgemont High (1982), in the role of surfer-stoner Jeff Spicoli; his character helped popularize the word “dude” in popular culture. Sean Penn's first film role was alongside Tom Cruise and Timothy Hutton in Taps in 1981. Penn then garnered acclaim for his first starring role in 1983’s Bad Boys and for the drama The Falcon and the Snowman (1985). Penn starred in the drama At Close Range (1986) which received critical acclaim. Colors (1988), gave another searing performance as a US soldier in Vietnam committing atrocities in Casualties of War (1989) and appeared alongside Robert De Niro in the uneven comedy We’re No Angels (1989). In 1982 Sean Penn played the stoner and surfer Jeff Spicoli in Fast Times at Ridgemont High. He helped coin the popular term 'dude' in that time. Almost unrecognisable with frizzy hair and thin rimmed glasses, Penn was simply brilliant as corrupt lawyer David Kleinfeld in the Brian De Palma gangster movie Carlito’s Way (1993). This performance earned him a Golden Globe nomination for best supporting actor. The Academy Awards first recognized his work in nominating him for playing a racist murderer on death row in the drama film Dead Man Walking (1995). For this role he also received Golden Globe nomination and an Independent Spirit Award. In 1983 Sean Penn played Mick O'Brien in Bad Boys. This role helped launch him as a serious actor in Hollywood. Also in 1995, he wrote, produced and directed The Crossing Guard, a dark drama starring his boyhood idol, Jack Nicholson. The film received positive reviews from critics. Sean then played the brother of wealthy Michael Douglas, involving him in a mind-snapping scheme in The Game (1997) and also landed the lead role of Sgt. Eddie Walsh in the critically acclaimed World War II drama The Thin Red Line, directed by Terrence Malick. In the 1986 film At Close Range, Sean appeared with his brother Chris and mother Eileen. For his portrayal of Emmett Ray in Woody Allen’s Sweet and Lowdown in 1999, he received another Academy Award nomination. He received his third Academy Award nomination after portraying a mentally handicapped father in I am Sam (2001). In 1985 Sean Penn married the pop icon Madonna. Andy Warhol was a wedding guest. Also in 2001 Sean directed his third film, the mystery drama The Pledge (2001), again starred Nicholson and Wright Penn. In 2003 Penn won the best actor honours at the Venice Film Festival for 21 Grams (2003), and the following year he received a best actor Oscar for his role as the grief-stricken father of a murdered young woman in Mystic River (2003). In 1986 Sean starred with Madonna in the movie Shanghai Surprise. Penn’s subsequent films include The Assassination of Richard Nixon (2004), based on an actual attempt on the president’s life; The Interpreter (2005); and All the King’s Men (2006), an adaptation of Robert Penn Warren’s novel about a populist politician. His fourth film as director, the biographical drama survival movie Into the Wild (2007), garnered critical acclaim and two Academy Award nominations. Stepping back in front of the cameras, Penn won his second Academy Award for best actor for his portrayal of the first openly gay politician, Harvey Milk, in the film Milk (2008). Sean Penn spent 32 days in jail in 1987 because he hit an extra on set. After that, Penn starred in Fair Game, an adaptation of author Valerie Plame’s novel of the same name, and co-starred with Brad Pitt and Jessica Chastain in director Terrence Malick’s critically acclaimed drama The Tree of Life in 2011. In 2013, he appeared in two movies: Gangster Squad and The Secret Life of Walter Willy. In 2015, Penn starred in The Gunman, a French-American action thriller based on the novel The Prone Gunman, by Jean-Patrick Manchette. Penn also voiced characters in animated fare, including Persepolis (2007) and Angry Birds (2016). Sean Penn has an estimated net worth of $150 million. In 1989 Sean Penn and Madonna ended their marriage. He was married to pop star and actress Madonna from 1985 to 1989. Penn and House of Cards star Robin Wright wed in 1996 and have two children: a daughter Dylan Frances (born April 13, 1991) and son Hopper Jack (born August 6, 1993). The couple divorced in 2010. Sean Penn married Robin Wright in 1996, after an on again off again relationship and the birth of their daughter Dylan Frances in 1991 and son Hopper Jack in 1993. They filed for divorce and reconciled a few times before finalizing the end of their marriage in 2010. In addition to his film work, Penn is known for his political and social activism. In September 2005, Penn traveled to New Orleans, Louisiana, to aid Hurricane Katrina victims. After the 2010 Haiti earthquake, Penn founded the J/P Haitian Relief Organization, which has been running a 55,000 person tent camp. Along with Johnny Depp, John Malkovich and Mick Hucknall, Penn co-owned the French restaurant-bar Man Ray, located near the Champs-Élysées in Paris. Sean appeared with his brother Chris Penn in At Close Range (1986), in which their actress mother, Eileen Ryan, played their grandmother. Penn is the 9th person to win 2 Academy Awards for Best Actor. He was Christopher Nolan and Warner Bros. first choice for the role of the Joker for the movie The Dark Knight (2008) but he turned down the part because he didn’t want to play a role that had already been played by his longtime friend Jack Nicholson. The role ultimately went to Heath Ledger. Sean moved to Marin County (North of San Francisco) to avoid raising his children in Hollywood. Sean Penn won his second Academy Award for Best Actor for his roles as Harvey Milk in the 2008 movie Milk. He lost his home in Malibu due to a fire in November 1993. Penn quit smoking for a while on his 40th birthday for health reasons. Prior to that, he was known as one of Hollywood’s heaviest smokers, smoking at least four packs of cigarettes a day. A popular indie-band in The Netherlands is called “Seanpenn”. Penn served 32 days in jail in 1987 for hitting an extra. He refuses to talk about his ex-wife Madonna in interviews. On her 1989 “Like A Prayer” album, she wrote a song about their failed marriage called “Till Death Do Us Part”. In 2004 Sean Penn was invited to join the Academy of Motion Pictures Arts and Sciences. He toured Caracas, Venezuela, in August 2007 with President Hugo Chávez. Sean Penn won an Academy Award for his role in the 2003 movie Mystic River. He had already been nominated for several roles in other movies such as Dead Man Walking, Sweet and Lowdown, and I am Sam. Penn is an avid surfer.